Assigned to C Company, 2nd Battalion, 3rd Special Forces Group (Airborne), Fort Bragg, N.C. in 2003, Master Sergeant (MSG) Benjamin “Ben” Bitner, 37, was serving his sixth tour of duty overseas and his tenth operational deployment. He had also done tours in Africa, Kosovo, Kuwait and Iraq. MSG Bitner died April 23, 2011 in Kandahar Province, Afghanistan of wounds suffered when insurgents attacked his unit using an improvised explosive device. A 1991 graduate of Greencastle Antrim High School in Greencastle, Pennsylvania, MSG Bitner enlisted in the U.S. Army later that same year and attended Special Forces Assessment and Selection. 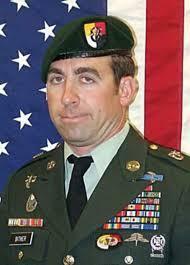 In 2000, he graduated from the Special Forces Qualification Course as an engineer sergeant. MSG Bitner served in a variety of assignments including assault team member for Company B, 2nd Battalion, 3rd Special Forces Group (Airborne) as well as senior Special Forces engineer sergeant, intelligence sergeant, and team sergeant for Company C, 2nd Battalion, 3rd Special Forces Group (Airborne). “A special operations warrior is a volunteer who has seen where the action is and wants to go into where the action is,” said Geoff Barker, who served with both British and U.S. Special Forces. MSG Bitner’s awards and decorations include six Bronze Star Medals and the Purple Heart Medal. MSG Bitner is remembered as a great leader and a loving father, husband and son. He was an avid outdoors sportsman who loved climbing, hunting, camping, and mountain biking. He is survived by his wife and two sons. MSG Bitner’s son is a Children’s Fund Folds of Honor scholarship recipient.